Feel the adrenaline of a world land speed record attempt at the Bonneville Salt Flats, go a couple rounds with Suzuki’s new heavyweight streetfighter, take a week in Colorado to learn the finer points of off-road adventure riding, and you’ll still just be warming up to the July 2015 issue of Motorcycle Mojo. We’ll also take you to Savannah, Georgia, where the new for 2015 CBR300R gets a thrashing on the track, proving bigger isn’t always better. Next it’s off to explore Idaho’s high country with Liz Jansen, and then as only he can do, Alan Cathcart discovers more Unobtainium in the form of the one-of-a-kind EMU BSA M46. There’s even fun for the whole family with Dustin A. Woods getting a taste of Gymkhana on a Honda Grom; what’s this you ask? 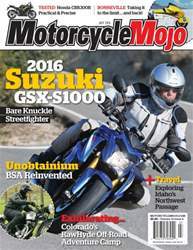 Turn the pages and find out, along with much more in the July 2015 issue of Motorcycle Mojo.